Hundreds queued from before dawn to get into Dublin's newest doughnut shop. DUBLIN HAS DEVELOPED a fondness for doughnuts over the past few years, but the opening of few outlets has matched the Krispy Kreme madness of the last 24 hours. Doughnut enthusiasts took to social media to document the experience, with several parents it seems, roped in to get there before school began. Local Fine Gael councillor Ted Leddy was one of the first inside the doors and said he wasn’t prepared for all the fuss. I wasn’t quite prepared for what a big deal it was. There were about 300 people queuing at 7am, some had been there since 4am. I was happy to be there because it’s 120 jobs and a lot of them are local jobs. The craze shows no sign of dying down just yet, with queues reported from early once again this morning. Martha Dowling from Clonee said her children bribed her to pick some of the sugary treats up on her way home from work yesterday. My kids made a deal with me, they would clean downstairs in my house if I got them a box of Krispy Kremes on the way home. The new outlet has a drive-thru facility and Dowling said when she arrived at about 7pm yesterday evening, she was warned she may have to queue for up to an hour. However she got through the queue within 20 minutes and secured a mixed box for her entrepreneurial children. Dowling says the house was “lovely and clean” by the time she got home. In a statement, Krispy Kreme said it was ”overjoyed to have people from all around Ireland share the excitement of opening day”. 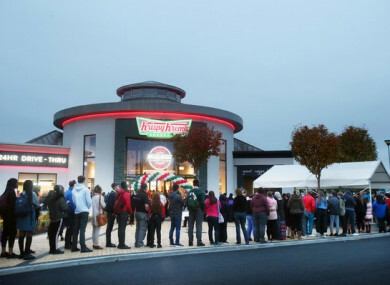 Email “Hundreds of people in Blanchardstown have queued for doughnuts over the last two days”. Feedback on “Hundreds of people in Blanchardstown have queued for doughnuts over the last two days”.